What can be more rewarding to a phone lover especially those who are so into heavy downloads other than an unrestricted access to unlimited WiFi connection absolutely free. This is exactly what Zenith bank has just introduced for all its customers. 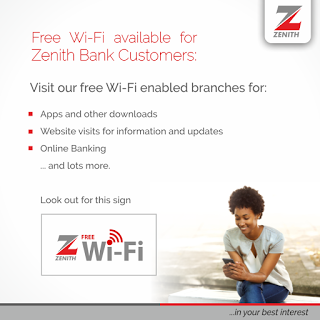 Zenith bank has just introduced free Wi-Fi connection in all its branches and it's unlimited. Although the Wi-Fi is password protected but all you need to gain access is just a Zenith bank account. So if you have a Zenith bank Account then that's your password. ==> Visit any Zenith Bank branch close to you. ==> Turn on your WiFi and search for available Wi-Fi connection. ==> Select the WiFi named "ZENITH BANK FREE HOTSPOT" or any name similar to that. ==> When asked for password, input your Zenith bank account no and connect. In case you don't have a Zenith bank account, just use the one in the image below. If you have any question, feel free to ask and also don't forget to subscribe for more updates.